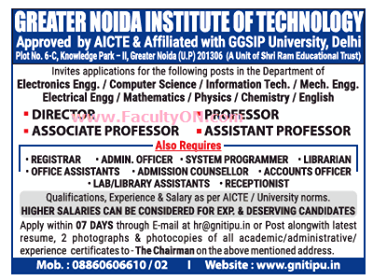 Greater Noida Institute of Technology, Greater Noida has advertised in THE TIMES OF INDIA Newspaper for the recruitment of Professor plus Associate Professor plus Assistant Professor job vacancies. Interested and eligible job aspirants are requested to apply with in 7 days. Check out further more details below. About College: Established in the year 2001, GNIOT group of institutions has become one of the leading institutions for management and engineering programs worldwide. Our aim is to educate leaders who build a strong organization and wisely leverage the power of markets to create lasting value. The founders are some of the best minds from the corporate and academic worlds. In their perspective, the changing business landscape requires young leaders to have understanding of developing economies and global practices. GNIOT is committed to creating such leaders through its innovative programs, outstanding faculty and thought leadership. At GNIOT, we share a strong commitment to a diverse community.